It contains the Value itself and the key: the string length and data. Definition at line 125 of file StringMap.h. Definition at line 129 of file StringMap.h. Definition at line 132 of file StringMap.h. Definition at line 155 of file StringMap.h. Referenced by llvm::Value::getName(), and llvm::StringPool::intern(). Definition at line 181 of file StringMap.h. Definition at line 186 of file StringMap.h. Definition at line 200 of file StringMap.h. Referenced by llvm::PooledStringPtr::clear(), llvm::Value::deleteValue(), llvm::StringMap< uint64_t >::erase(), and llvm::ValueSymbolTable::~ValueSymbolTable(). Definition at line 208 of file StringMap.h. Definition at line 150 of file StringMap.h. Definition at line 136 of file StringMap.h. Referenced by getFilename(), llvm::Value::getName(), and llvm::StringMap< uint64_t >::insert(). 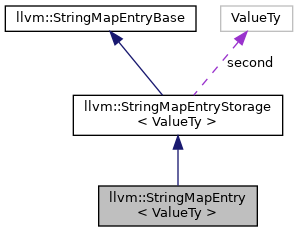 The string data is always stored immediately after the StringMapEntry object. Definition at line 148 of file StringMap.h. Referenced by llvm::PooledStringPtr::begin(), llvm::StringMapEntry< llvm::Comdat >::Create(), llvm::PooledStringPtr::end(), and llvm::TargetIntrinsicInfo::getIntrinsicID(). GetStringMapEntryFromKeyData - Given key data that is known to be embedded into a StringMapEntry, return the StringMapEntry itself. Definition at line 192 of file StringMap.h. Definition at line 140 of file StringMap.h. Referenced by llvm::PooledStringPtr::clear(), llvm::DwarfStringPool::emit(), llvm::StringPool::intern(), llvm::orc::SymbolStringPtr::operator*(), llvm::orc::SymbolStringPtr::operator=(), llvm::PooledStringPtr::operator=(), and llvm::PooledStringPtr::PooledStringPtr(). Definition at line 141 of file StringMap.h. Definition at line 143 of file StringMap.h. Referenced by llvm::Value::getName(), and llvm::Value::takeName(). Definition at line 127 of file StringMap.h.